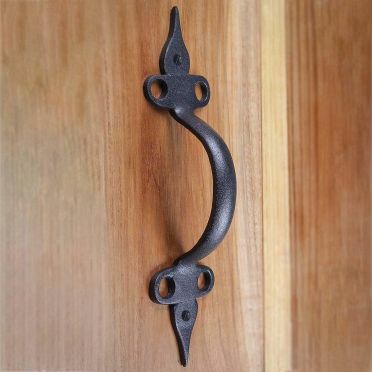 Our Wrought Iron Spear Cabinet Pull is hand-forged, and makes a beautiful as well as functional addition to your home. Has our exclusive protective finish. Crafted of Hand-forged Wrought Iron. Looks beautiful on doors, and gates. Perfect for kitchen pantry doors and oversized drawers. 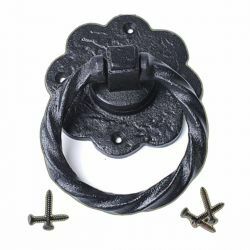 These outstanding cabinet Pulls crafted of wrought iron are popular on doors, gates, kitchen pantry doors and oversized kitchen drawers. A nice detail for a modern look or for authentic Colonial or Country style. Affordably update old doors or a bedroom armoire. An exclusive coating protects this item for years to come. Measures 10-1/2 inches in length. Mounting hardware included.